Neda would have been 27 years old today. If she lived in a free country she probably would have been celebrating her 27th birthday with her family and her fiancé, Caspian. The bullet that killed Neda however made a nation alive and now Neda will live forever as a symbol for people who fight for freedom and democracy. Press TV's constant lies about Neda to tarnish her image became a focus point for those who wanted to mark this day in London. 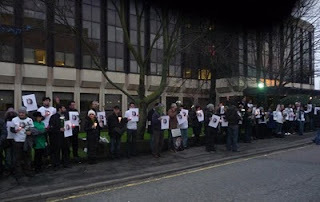 Iranian ex-pats as well as non-Iranians gathered outside Press TV offices in Hanger Lane to commemorate Neda and at the same time perhaps jolt the conscience of those who are still working for this propaganda arm of the messianic junta in Iran. The event started off with Andreas Moser reading out a letter by Caspian on who Neda was and what Neda wanted from life. 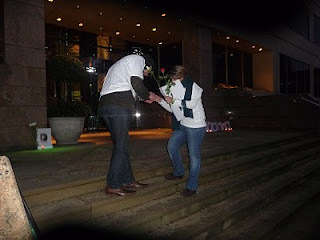 Then some of Neda's favourite songs were played and while her favourite songs were playing in the background, one by one, the attendees took a picture of Neda, with a single rose, her favourite flower, walked up the steps leading to Press TV's building and laid Neda's pictures by the entrance door while lighting a candle by Neda's picture. It was an incredible procession and even a spiritual moment for some. It was sombre but also inspiring at the same time and those taking part felt a special closeness to Neda. Every picture, rose and candle was a reminder of all the Nedas of Iran who are no longer with us and at the same time a slap in the face of a shameless propaganda media outlet that disseminates lies about our fallen martyrs. By the time all the pictures and candles were lit the evening darkness had set. Neda's pictures and the lit candles by Press TV's entrance door were an incredible scene. One minute silence was held as a sign of respect, and people were asked to write a message for Neda's family in a memorial book which wil be sent to them. For the finale of the evening, Caspian Makan himself was contacted on the phone and through the loud speaker, Caspian personally thanked all those who had taken part in the event and commemorated Neda. The event was covered by Aljazeera English, ITN, Channel4, London Weekly Kayhan and some Iranian news websites and freelance reporters. VOA Persian arrived late at the end of the program and BBC Persian apparently got lost on their way to Hanger Lane! Potkin thanks as always for organizing and publicizing. Lets all get ready for Feb. This VOA Persian reporter in London, Madia Mossavar is a complete joke. She always misses events and always lies with some pathetic excuse. I am surprised at the unprofessionalism of the BBC Persian reporter though, who was it? I can't understand how it's legal for Iran to run a propaganda and hate station in britain. Can North Korea open a tv station here too? It was a dignified event, moving and celebratory. Thanks for organising it. I think you made a mistake Arash. The people that organised teh embassy one went out of their way to stop people from coming to Press TV. They even spread a lie that Caspian wanted people to go to the embassies which was quite the opposite. The gang that deliberately set the embassy thing at the same time are working hard to waste everyone's efforts and turn them into useless events with no news value. They were protecting their master's television station and you fell for it unknowingly like the others there. I see. I was invited to both and was under the impression that they were organised by the same group, I chose the embassy one as I didn't have time to travel as far as Hanger Lane. If what you say is true, then I certainly did make a mistake. Had I known that they were subtly trying to defend the Mullah PressTV I wouldn't have gone. How shameful. It is a real shame that Iranians cannot stand together, does it matter where an opinion is voiced, surly it should matter if an opinion is voiced.. I feel that by having two, three, four demos over london at one time surly hightens our cause, This is something that should be embracced and not shunned. As we know the iranian embassy is near so many famous london landmarks, which many thousands of tourists visit, so as these people walk past isnt it good that they also see what is going on in Iran and they can be educated on the subject. We have certainly lost our Iranian heritage and this has become evident in the way we are fighting for our country. We need to stand as one, as we are all foreigners in this country we need to take a leaf out of the torah, or jewish community and unite under one banner, the banner of Iran, Irrespective of gender, religion etc.